Happy National Blueberry Pancake Day! As if we need an excuse to make pancakes. 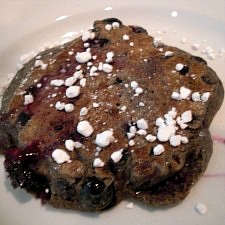 On the weekends Erin loves to whip up this quick recipe for whole wheat blueberry pancakes. Give it a try, you won’t be disappointed. Side notes: For vegan pancakes or allergy-free pancakes, use EnerG. egg re-placers, or applesauce for the 1 egg. Step 1: Heat the coconut oil to a liquid consistency. Add coconut oil to the mixing bowl. Then add the 1 cup of pancake mix. It is important to add the coconut oil to the dry ingredients first because it tends to re-solidify when added to cold ingredients. Step 2: Mix the coconut oil and batter mix well. Then add 1 egg, 1 cup almond milk, 2 tbsp vanilla. Stir everything together until it’s a smooth consistency with no lumps. Step 3: Add the fresh or frozen blueberries to the batter. Step 4: Heat the griddle and add coat with coconut oil before putting on any pancake batter. The coconut oil acts as a non-stick spray. When the griddle is warmed, drop two heaping spoonfuls onto the pan. Cook on one side until the edges look crispy and there are air bubbles that slightly pop in the center of the pancake. Flip the pancake over, heat for another 2–3 minutes. Remove from heat before burning! Step 5: “Butter” the pancakes with coconut oil. Sprinkle with powdered sugar and maple syrup. Enjoy!